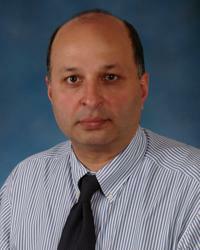 Dr. Badros has extensive clinical experience in Bone Marrow Transplantation with special interest in multiple myeloma. He was involved in the initial trails of thalidomide and has conducted many clinical trials for treatment of relapsed and refractory multiple myeloma. Dr. Badros research has focused on evaluation of immunological approaches to eradicate residual myeloma cells in the high-risk setting following autologous stem cell transplantation using natural killer (NK) and interleukin -2 (IL-2) activated cells and non-myeloablative allogeneic donor grafts. Dr. Badros is involved in the development of targeted novel therapeutics. He has completed a gene therapy trial using G-3039 ""Bcl-antisense."" He evaluated the use of the proteosome inhibitor ""bortezomib"" in the newly diagnosed myeloma patients and evaluated the effects of bortezomib on stem cell. Currently, Dr. Badros is evaluating various combinations of novel therapies in multiple myeloma such as Lenalidomide and histone deacetylase inhibitors (SAHA) in relapsed myeloma patients alone and in combinations with dexamethasone and/or bortezomib.